When ex-convict Thomas Harley arrives at a boarding house where he lives with his daughter June, he is arrested for robbing a bank and killing a bank guard. He claims that he was summoned to the Carey Theatrical Warehouse by a note that sent to him by his former cell mate, Dave Wyatt, and was subsequently locked inside. The police do not believe his alibi because Wyatt has been dead for eight years. 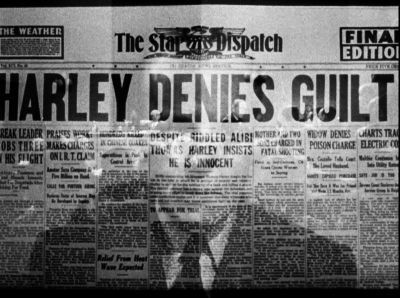 Fingerprints belonging to Harley are found at the crime scene, and he is put on trial, found guilty, and condemned to death. Desperate to prove her father innocent, June asks Charlie Chan to recommend someone who can help her and her father. Chan writes a name and address on a piece of paper and hands it to June. 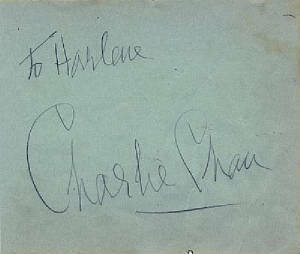 The note bears Chan's name and and that of his hotel. He agrees that the case against her father is suspect. Together with June's boyfriend, prison guard Hugh Kensey, Chan questions Mrs. Foss, the landlady of the boarding house, who often rents rooms to ex-convicts. It is determined that the note that was supposedly sent to June's father by Wyatt was written on Foss' typewriter. 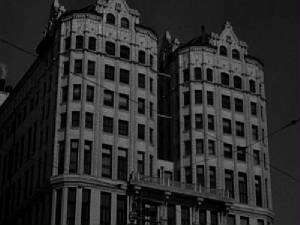 Chan then questions the other boarders: Miss Petrie, who works for a small salary at a social foundation; Mr. Johnson, a bookkeeper for the Carey Theatrical Warehouse; Mr. Danvers, a bank alarm salesman; and Emily Evans, a showgirl whose costume was found at the warehouse. Both Danvers and Evans had traveled to other cities immediately before banks in those locations were robbed. 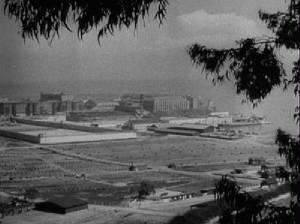 The next day, Chan, son Tommy, and chauffeur Birmingham Brown, drive to San Quentin Prison where Thomas Harley is awaiting his nearing execution. On the way there, an unknown assailant shoots at them. Chan deduces that only the persons at the boarding house knew of his plan to visit the prison that day. Chan becomes convinced that the fingerprints that were found at the scene of the crime were somehow forged. After studying the police reports, Chan discovers that although a different man was convicted for each of the previous robberies, each man had been jailed at the same prison, and the modus operandi used was identical in each case. Miss Petrie is revealed as the wife of Jimmy Slade, a convict trustee, who is employeed in the fingerprint bureau of the prison. When Petrie disappears, Chan, Birmingham, and Tommy hurry to the warehouse. Outside of the warehouse they are nearly run down by a delivery truck which then speeds off. Inside, they locate Johnson, who suspiciously feigns hearing difficulty. A little later, Petrie is run down and killed by the same delivery truck that had earlier attempted the same on Chan and his party. When Chan returns to the prison, he finds that the fingerprint cards have been tampered with. Slade overhears Chan, and is mortally wounded during a futile attempt at escape when the gun he is using misfires and shoots him due to a plugged barrel. After stating that he will not take the rap, Slade dies. 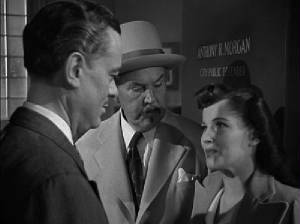 Chan then takes fingerprints of all of the borders at Mrs. Foss' boarding house, and finds Johnson's on one of the cards from the prison's files. Returning to the warehouse, Chan finds the equipment necessary for forging fingerprints in the back of the truck that had killed Petrie. Danvers then tries to kill Chan, as he did Johnson, to prevent him from talking. After Harley is cleared, Chan explains that Slade had sent the prints to Johnson, who had copied them for Danvers, who had carried out the robberies. 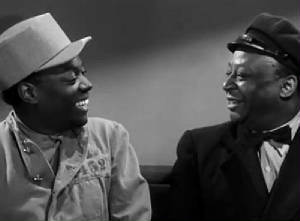 He adds that Kensey was the leader of the gang, and when Harley had opposed his marriage to June, the guard framed him. 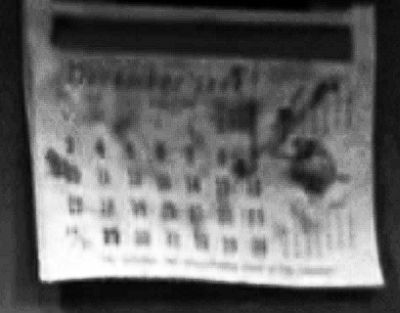 NOTES: The film's working titles were Fatal Fingerprints, Fatal Fingertips, and Charlie Chan in Alcatraz. 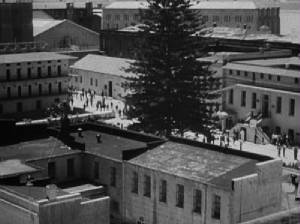 Stock footage used in Dark Alibi shows California's San Quentin State Prison. 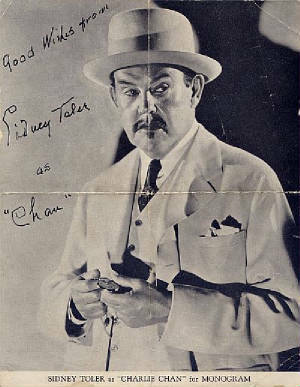 The opening title card reads: "Charlie Chan in 'Dark Alibi.'" The Call Bureau Cast Service Lists Minerva Urecal as "Mrs. Foss." However, production information included in the file on the film at the American Motion Picture Arts and Sciences library states that she was replaced by Edna Holland, who is listed in the onscreen credits. Ancient proverb say, "One small wind can raise much dust." Honorable grandmother always say, "Do not think of future - it come too soon." Ugliest trade sometimes have moment of joy. Even gravedigger know some people for whom he would do his work with extreme pleasure. Remember old saying: "Earthquake may shatter the rock, but sand upon which rock stood still right there in same old place." What is my reputation compared to man's life? Never believe nightmare no matter how real it may seem. Accidents can happen, if planned that way. Skeletons in closets always speak loudest to police. Bad men leave marks wherever they go. No experiment is failure until last experiment is success. 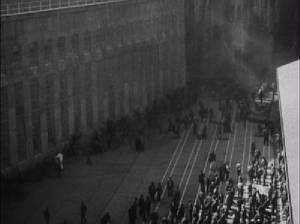 Many contemptible persons in prison. Government work keep me hopping like dissatisfied flea from dog to dog. (Mrs. Foss: "That's all I have to say.") That's what woman always say, yet go right on talking. (Birmingham: [driving to the prison] "Mr. Chan, is this the shortest way to prison?") No, shortest way is commit crime. At moment, I am like man trying to set clock by guess. And as time does not stand still, perhaps better not stand still myself. Son Tommy is noisy woodpecker on family tree. For time, I nurse theory - very excellent theory - but now, instead of nurse, I fear theory needs undertaker. Instead of undertaker, doctor arrive, and theory now very healthy again. (Tommy: "Pop, I've got a swell idea.") Good, save it for old age. Everything now in lap of gods. Very soon I give very hardy shove, perhaps clue fall off of laps. in 1906 and was demolished in 1973. 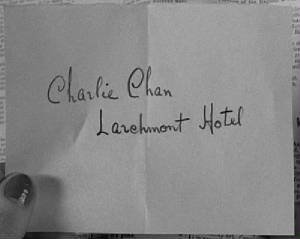 CHARLIE CHAN'S HOTEL AND ROOM NUMBER: Larchmont Hotel, Room 325. Larchmont is a small community located within the city of Los Angeles. THE TOWNS WHERE BANKS WERE ROBBED: Lamont and Rordon. Lamont is a "census-designated place" located in California's Kern County about 100 miles north of Los Angeles and 8 miles south of Bakersfield. Rordon may have been a location in California that no longer exists. in stitches - (Idiom) Laughing uncontollably. Danvers: "...she always leaves me in stitches!" frame - (Informal) Made up evidence or contrive events so as to falsely incriminate a person. Warden Cameron: "...our prison cards couldn't have been used to frame these men." needle - (Informal) To tease. Danvers: "Always giving me the needle..."
sent up - (Idiom) Sent to prison. Short for "sent up the river." 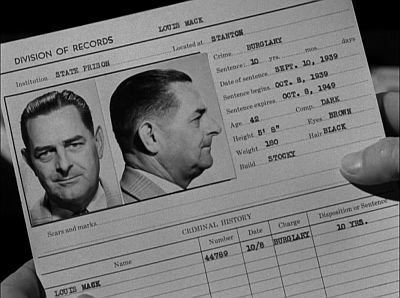 Anthony R. Morgan: "Harley was sent up for the bank robbery in this city."